One more photo of the Nishinomiya-Ko Bridge (on the Wangan Expressway in Osaka Bay) before we move on. I was tempted to show the bridge after the 1995 earthquake, but I think I'd rather show bridges at their best, since I spend too much time at work looking at bridge damage. 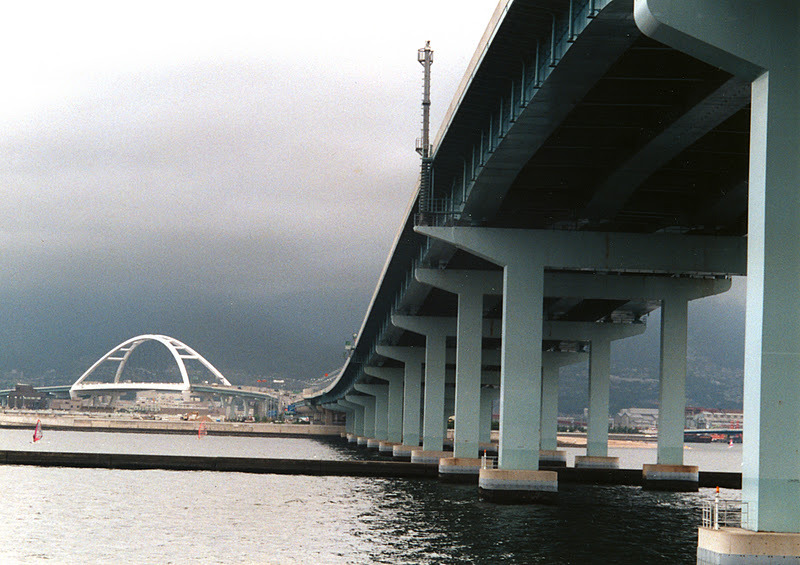 The Hanshin Expressway Public Corp. (HEPC) calls the Nishinomiya-Ko Bridge a Nielsen-Lohse arch with a steel deck. I'm not sure if this is quite accurate since the steel hangers cross each other. The arch is supported on W-shaped piers on closed caissons (by which I mean that pressurized air is pumped into the caisson to keep the water out while its excavated from within until it reaches its proper depth). I've gone into the airlock of several closed caissons, but when they pressurize it, my nose starts to bleed and my ears feel like they are about to burst. Also, you sometimes have to wait before they'll let you back onto the surface (so you don't get 'The Bends'). The Nishinomiya-Ko Bridge is 252 m long and about 30 m wide. It was built for the HEPC in 1993 at a cost of 7.4 billion yen. Since a steel tie under the deck restrains the arch force, a pontoon system was used to place the arch onto big spherical bearings (that split in two during the earthquake). The little red things in the water are wind surfers who were all over the Bay. Osaka Bay Bridges: Nishinomiya-Ko Bridge (2) by Mark Yashinsky is licensed under a Creative Commons Attribution-NonCommercial-ShareAlike 3.0 United States License.